I used to help my Mother and Grandmother bake during the holidays. Every major holiday revolves around large meals and I became a part of the preparation at an early age. I grew to love the restaurant business at fifteen when I got a job as a busboy. From that point I dabbled in the different positions within restaurants, spending time as server, bartender, manager, then finally kitchen employee. After I worked my first week in the kitchen I knew that I would never leave it, and that I felt at home around food all day. This compelled me to become a chef and attend Johnson & Wales University to study culinary arts. The combination of chefs’ culinary styles and techniques I have spent time studying under have been inspirational to me and have helped to mold my own culinary personality. I will forever be appreciative to Chef Tony Chittum for giving me a chance to be his culinary intern when I had little kitchen experience to speak of. I also learned a lot from Andrew Markert, Miles Vaden, and Shannon Overmiller along the way. I think that I grew the most as a chef during my three year stint at Fiola, learning immensely from Fabio Trabocchi how to effectively manage a large staff and elevate cuisine to the next level. What dish on the menu are you most curious to see how it’s received? I currently ask the staff at Live Oak for feedback on the Rohan Duck & Dumplings dish that we just put on the supper menu. The pan-roasted duck breast is served atop shredded duck confit leg and thigh meat that has been sautéed with roasted baby carrots, celery, leeks, and buttermilk biscuit dumplings. The final touch is a table-side pour of duck veloute to round out the entrée. Some ideas make more sense in my head than they do on the plate, but ultimately we want the guests to receive them well and come back for more if they did in fact enjoy it. What do you do to ensure that the food going out to customers is of a high quality? I attempt to source as much food as I can from local purveyors. I also believe that it is essential to know as much as possible about where our food comes from and how it is raised. I have developed sound relationships with farmers over the last ten years working in kitchens in the metropolitan area. Our menu is riddled with various local produce items from farms like Earth N Eats and Bounty Hill. I also carry meat and chicken sourced here in Virginia. 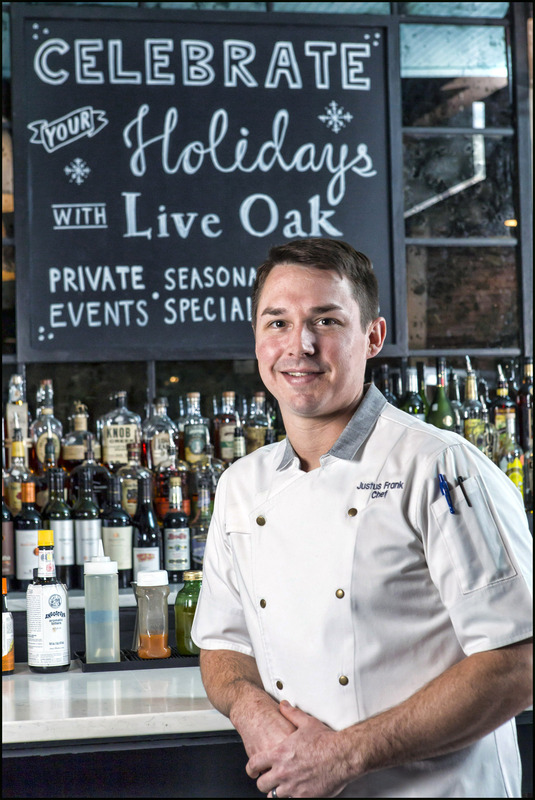 It is important to us at Live Oak to support small business and encourage other people within the industry to showcase these locally grown goods that are consistently proven to be unparalleled in quality. I am asked this question quite frequently, and my answer changes depending on my current craving. I have always been amazed by Daniel Boulud and Massimo Bottura. My perfect meal would have head cheese and foie gras made by Boulud and pasta and seafood made by Bottura. Chef Daniel Boulud is a French chef and restaurateur with restaurants in New York City, Washington D.C., Las Vegas, Palm Beach, Miami, Montreal, Toronto, London. Chef Massimo Bottura is an Italian restaurateur and the chef patron of Osteria Francescana, a three-Michelin-star restaurant based in Modena, Italy which has been listed in the top 5 at The World’s 50 Best. I seem to find the most satisfaction out of a Bacon Cheeseburger and French Fries. When at work it’s nice to have something sweet (lemon bar, pecan sandie, beignet) at the end of a shift where most of my consumption was savory. (L to R) PA Venison Carpaccio, Head-On Shrimp & Weisenberger Grits, Rohan Duck & Dumplings, and Apple Spice Cake.